In outline view, a new note is added after the selected note, or at the end of the outline if none is selected. In a map, a new note icon is added to the right of the currently selected item, to the right of the top-right-most map icon if no note is selected, or if making the note via a right click it is at the mouse cursor position. So far, so good. New items added in the map simply take the $OutlineOrder one higher than the last listed note for that container (all notes below that have their value bumped up one) so we know where it will appear. However, notes added in Map view via a double-click on the map background are treated differently; Tinderbox will try and add the note in outline order one higher than the note to the left and/or above it on the map. This helps if adding notes into a sequence that are later overlapped or viewed as a group in a different view. (See more on adding notes to maps). For a note added in outline, TB will try to place it to the right of the preceding ($OutlineOrder) item on the map or close to it if the new icon would overlap other existing map note/container icons. The above may all seem rather complex but just go experiment and you will see the 'rules' for order and placement are pretty simple once you have tried them out. Rules are less clear for map placement for items demoted/dropped into containers (via any view type window), but generally selection moved this way will retain their relative positions. Even if created in outline, a new note gets a $Xpos/$Ypos value pertinent to that container. If such a note is dropped into another container, it appears to try to maintain those co-ordinates unless that conflicts with those of a note already occupying that location in the destination container('s map); if such a clash occurs then TB uses its logic for new items placement to de-conflict the icon positions. Very occasionally, two items of the same height/width will overlap exactly; in such circumstances switching to an outline view can be useful in locating any inadvertently 'hidden' items. 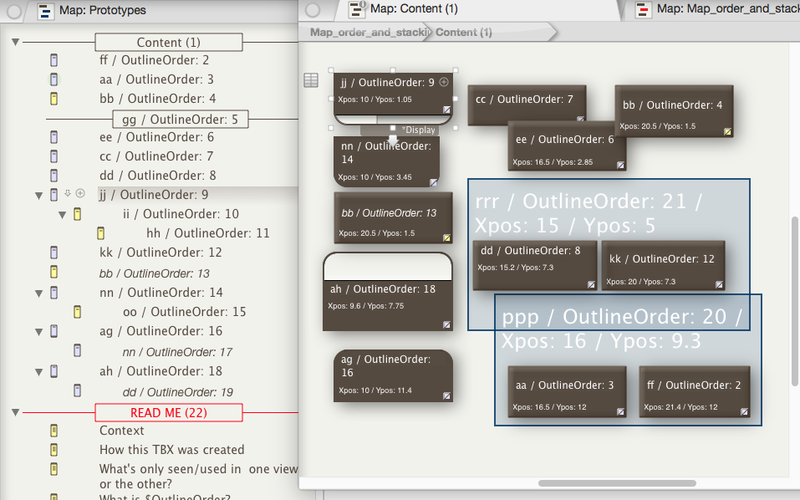 If you start adding data in outline view, the map when first opened can look a bit messy. Conversely, you may find the outline's order looks a bit incoherent with differing topics intermingled. Remember the above $OutlineOrder vs.$Xpos/$Ypos description. Re-ordering the outline via drag drop will not move map icon but may affect stacking order if icons overlap. Re-ordering the map by moving around icons won't affect the outline view (unless you alter overlapping priorities). Adornments and moving. Select an adornment and at top right it will show padlock and push-pin icons. Click these and the icons change. The change reflects the state of two Boolean attributes, $Lock and $Sticky (these can also be set via action code, rules, etc.). Normally, when an adornment is selected and moved, it moves independently of both the map background and any notes or other adornments. When an adornment's $Lock is true, it is locked to the map background. Selecting and moving a locked adornment simply scrolls the map; any items on the adornment move too but only because the whole map is moving. When an adornment's $Sticky is true, if moved it 'holds onto' any notes (or adornments) that are on top of it or partially overlap it. The adornment moves relative to the map background and any 'stuck' items move relative the the adornment. The latter makes it possible to easily move whole sections of a map around without complex selections. An adornment may be both locked and sticky in which case selecting and dragging the adornment scrolls the map whilst also bringing along any items stuck to it. Where adornments overlap, stickiness only applies to adornments (partially) on top of the sticky adornment, i.e. those with a lower $OutlineOrder value. It is worth noting that notes (and agents) have and can set $Lock and $Sticky attributes though doing so is generally not of great value compared to such use with adornments.